My heart? Yeah. That's not there anymore. It's gone. Torn to shreds. Thanks to you. 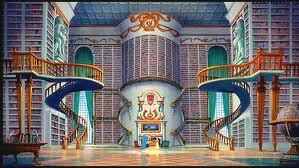 But, aside from the library in Beauty and the Beast, growing up, Cinderella was always my favorite. I just loved the idea of a rags to riches story, and I loved how Cinderella was sweet and kind and it payed off for her in the end, no matter how unlikely it was. I mean seriously, if the GRIMM BROTHERS will give Cinderella a happy ending, this girl clearly deserves a happy ending. They weren't exactly known for kindness in their fairy tales. But, this wasn't quite the case in Cinder. Instead of befriending little forest creatures, Cinder in our story befriends androids. She is New Beijing's best mechanic. She is a cyborg, and many of the normal humans look down on her because of that. She is treated as second rate. It reminded me very much of racial prejudices that existed in America between whites and blacks a few decades ago. Anyhow, Cinder has a lot against her. She's "down-and-out". I love underdogs. Because, typically, there's so much more to them than there is to someone who seems to have everything or to be winning. One day, Prince Kai, son of the emperor, stops by Cinder's kiosk in the market asking for some help with his android. This proves to be merely the beginning of her adventures. You see, there's something very unique about Cinder, which I won't give away for spoilers' sake. But she becomes a rather high point of interest over at the castle for more than a couple of reasons. Don't even let me start on Kai. Oh, I could gush on him for hours. He is sweet, kind, handsome, responsible, and he cares for his country. Let's just go ahead and add him to my list of book boyfriends. Pretty high up there, at that. Cinder is sweet, obedient, and kind. She thinks of others before herself, and does what's best for the people she cares about. She deserves the world, just like the classic Cinderella. 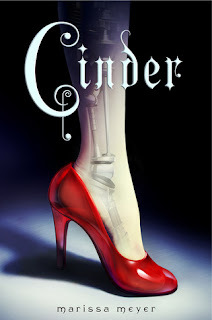 As the story moves on, things seem to be getting better for Cinder. And then boom, Marissa Meyer decides to tear my heart to shreds. Oh my gosh. The emotions. I can't even put into words. That ending. I'm still crying on the inside. When I picked up this book, I wasn't expecting much at all. I was expecting a four-star-at-best, happy, fun, Cinderella story. But no. WARNING: THIS BOOK WILL KILL YOU INSIDE. But you'll love it anyway. It was so amazing, so emotionally-attaching and heartfelt, and I know that it's going to be on my mind for quite some time. I am ever-so-eagerly awaiting the sequel, Scarlet, that comes out in (EEP) less than a month. So, is this novel real? Not at all. The emotional damage? VERY. VERY. REAL. "Even in the future, the story begins with Once Upon a Time." Thanks so much Joie! I can't wait to read Scarlet and see what both of us think! Why does this sound so amazing? Me needs. Cross-fingers that I might get it from the giveaways. @Jhobell- Yay! Let me know what you think about it if you decide to read it.